So we come then, to the questions of Tone and Taste. Choosing to make “Arachnids in the UK” (written by Chris Chibnall, directed by Sallie Aprahamian, titled after John Joseph Lydon) the episode that airs just before Halloween is pretty sensible. If you’ve got a horrifying idea, now’s the time to slap it on the screen. But given the intended audience, I think this episode is at or near the slimy high-water mark of how creepy Doctor Who can get. For Fendahl’s sake, we’re constantly exposed to a horror most people I know are repulsed by and actively work to remove from their houses. Also, there are spiders. So let’s hang back a bit and talk about Chris Noth’s Halloween Monster: “Boorish American Hotel Magnate With Political Ambitions Who Fires People.” That’s a bold move, isn’t it? For mainstream TV? Is that bold? It’s blatant, that’s for sure. Yet a bit subtle, too, because Noth is funny and accurate while never slipping into caricature. He’s genuinely fun to watch, and that’s why I have questions about Taste. 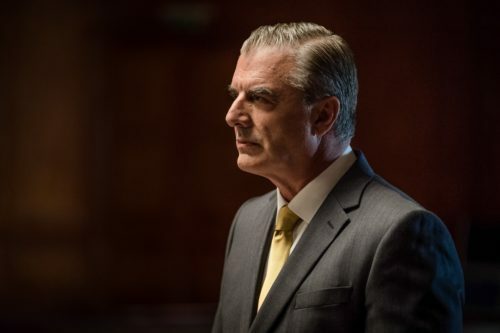 Chris Noth’s villain is based on a real person, who does not share the show’s values. Does making him a “fun bad guy” also then sort of make the real person seem less threatening to the values of the show? And then (SPOILERS for the person reading right behind you, Derek), he just walks away after doing that Terrible Thing on top of the other terrible things? No consequences at all? Is there a missing scene? Is it a metaphor for 2016? It just seems, ugh. 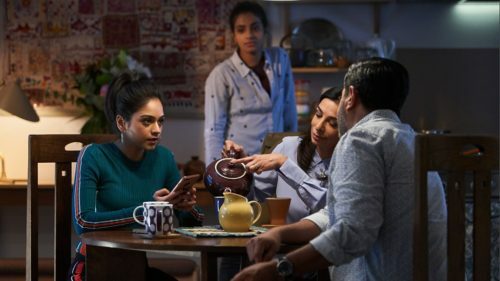 Counter to everything else the show is trying to say. The question of Tone also comes up in that aforementioned Terrible Thing the man with the gun does in an episode of Doctor Who. You get emotional whiplash from all the shifts. Terror! Sympathy! Shock! Mourning! Forget about all that: Friendship! Who knows if it’s in the writing, the direction, or the editing, but I feel like there’s some real tectonic grinding between Intent and Effect this week. And don’t dare think for a second about what that Panic Room is going to look like in about 24 hours. Even really big spiders can’t open the food boxes, and they don’t eat what we eat anyway. 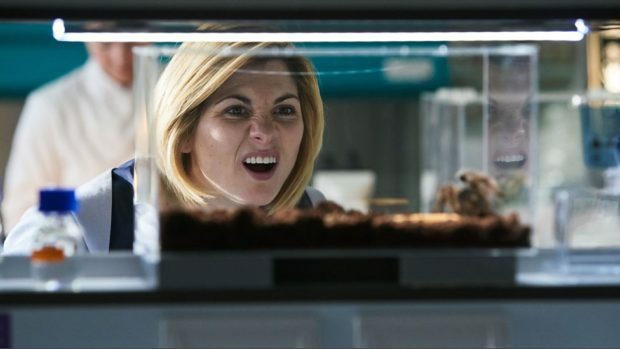 This solution that the Doctor calls “dignity” and the strangely misinformed scientist calls “humane and natural” seems to me a nightmare situation which should not have been left to the imagination, because imaginations are too good at this sort of thing. Taste and Tone. Nearly 600 words, and I haven’t even mentioned Yaz’s family yet. They were well good. Chibnall has his domestic situation TV skills, he does. Oh, and I meant to talk about what a number “Full Circle” did on me. Ach, there’s always too much to write about with Doctor Who. On to the Talking Points! ON ACTING: Team TARDIS doing well. They had to react to a lot of CGI this week, and did not disappoint. ON SOUND: We don’t have reliable scientific data on the noises made by giant spiders, praise be. I personally don’t think they’d be so slurpy and hissy, but only idiots like me listen to this show on headphones every week. Still digging the music of Segun Akinola. God, I love those strings. Irony! ON VISION: The opening POV shots evoked both spiders and The Shining: A+. Did you notice that bit where the Doctor goes upside-down and her hood flips so that just for a second she looks like Spider-Gwen, a.k.a. Ghost-Spider? Do you think they read comics at the BBC? That bit was my favorite bit, despite the, y’know, bowel-evacuating terror. ON DONNER UND BLITZEN: Christmas Episode is only eight weeks away, Derek! Most likely won’t include so many scuttling arthropods, but you never know. P.S. Is it Planet of the Fanboys, or the Planet of Fanboys? I can never recall. In any case, let them know this episode rates a “Kevin Groaning” out of a possible “No More Kevin”. *The computery voice in the “Next Time” trailer actually says “Risk to life: Ultimate,” but the inaccurate iTunes subtitles are, in this case, more fun.